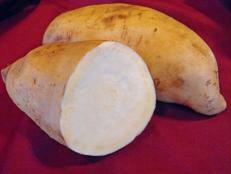 Sweet potatoes (Ipomoea batatas) are often confused with yams, a mistaken identity hande ddown by the first settlers. 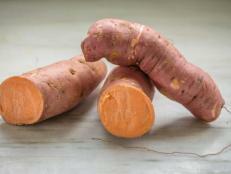 When compared by taste, yams are much starchier and drier than sweet potatoes. Due to the confusion, the U.S. Department of Agriculture requires that all sweet potatoes and yams be labeled separately. 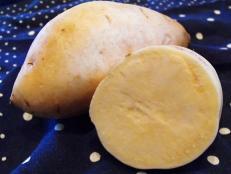 It is thought that edible sweet potatoes were cultivated in Peru. Some believe that the Polynesians that visited South America brought them on their travels. Research shows that they were cultivated in Polynesia before 1250 and reached New Zealand by the fourteenth century, then grown in Virginia by 1648. They predate the “Irish” potato by nearly half acentury. Sweet potatoes are primarily grown in tropical to subtropical regions. The top producing states are North Carolina, followed by California, Mississippi and Louisiana. Sweet potatoes prefer a daytime temperature of 75 degrees Fahrenheit with warm nights. Since they require a long growing season, USDA zones 7 to 8 are preferable. Sweet potatoes grow from slips, not seeds like most vegetables. Slips or rooted cuttings are sprouts that have matured to about 8 to 10 inches long, then cut just below the leaf joint toproduce roots. Purchase certified disease-free slips from online garden sources, garden centers and hardware stores. Sweet potatoes need a spot that is warm and well drained, with rich fertile soil that has a pH of 5.5 to 6.5. Plant slips in May to June when the soil has warmed, in earthed-up ridges. 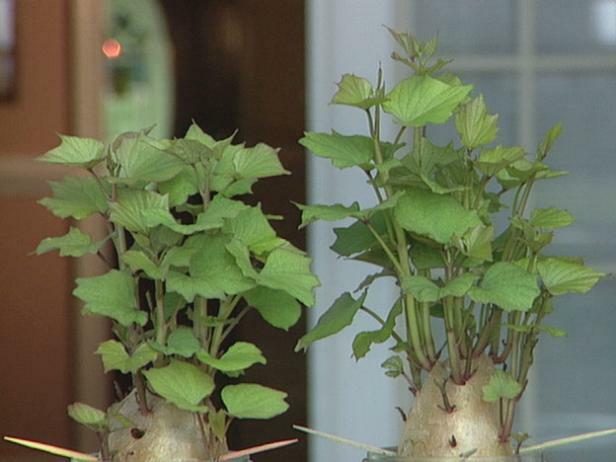 If slips are not available, as an alternative, place tubers with sprouting eyes in sandy, free-draining soil. Plant at a depth of 2 to 3 inches. Row spacing and distance would dependdirectly on the variety selected. 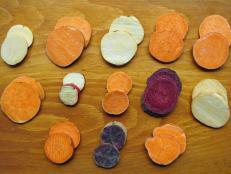 Note that sweet potatoes need lots of water, but are susceptible to rot if the soil is not well draining. 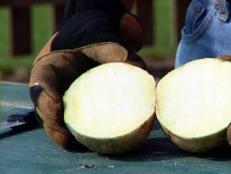 Once established, fertilize every two to three weeks with a high-potash fertilizer to encourage tuber growth. 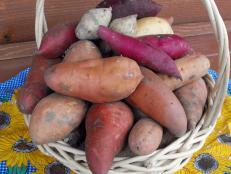 Typically, harvest the sweet potatoes 85 to 100 days after planting. A telltale sign for mature sweet potatoes is when the vines begin to yellow, generally 4 to 5 months after planting. For harvesting, use a garden fork and gently lift the soil, trying not to spear the roots. It is important to cure the tubers. Find a warm spot, such as a shed, garage or basement where the air is warm. 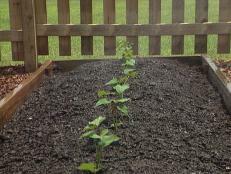 After two weeks, the sweet potatoes will lose sufficient moisture and keep for a month or so without sprouting. If not used within a month, bake, peel and freezefor maximum use throughout the year. Never store raw sweet potatoes in the refrigerator. Some pests and diseases are frequent problems for sweet potatoes. They include sweet potato weevils and pathogenic nematodes. Fungal diseases can attack stored tubers. If you suspect any pests or diseases, it is best to contact your local state extension service for control methods available in your area. What are Sweet Potato Slips? 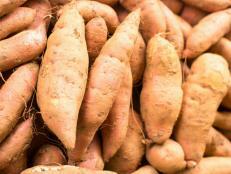 Where Do Sweet Potatoes Come From? 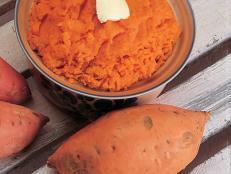 What came first, the sweet potato or the sweet potato slip? 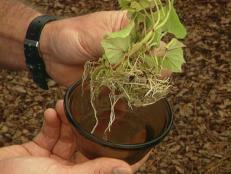 Find out how to grow sweet potatoes.